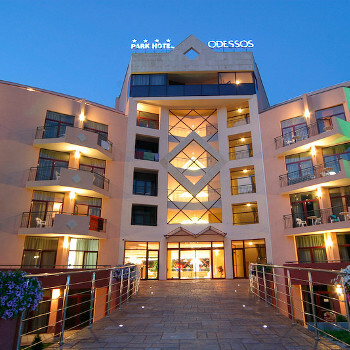 A good location is matched by great facilities and a happy atmosphere at the very comfortable Park Odessos. Just a couple of minutes from the long sandy beach and an easy walk for the resort centre, the hotel host family friendly entertainment. Although rated 4 star by official/tour operators it was more of a 3 star in comparison with the standard of Balearic island hotels, this appears to be a constant comment by many people, so knock off a star. Position - Just off the south end of bar street, and a short walk 300m to the beach down a slight hill. One of the noddy trains (2 Lev) stopped outside, going as far as the Admiral hotel. Pool was rather small and over run with small kids, hotel building and trees shaded the area a lot of the time. Rooms - These were more of a 3 star rating when compared to hotels in say the Balearic islands, double glazed windows so reasonably quiet. The airconditioning in the rooms and the restaurant seemed to be ineffective. Servicing was just adequate but no more. N.B. Bathrooms were hazardous, so please be very careful. The bath/shower tray was much higher than the bathroom floor with high sides making it difficult to get out unless you had very long legs, in addition the 'energy saving' lighting tended to switch off whilst in the shower leaving you in the pitch dark, so don't shut the bathroom door. The IR detector head sensitivity needed to be adjusted. Bar - This was expensive, 4 Lev for 500ml Bulgarian lager, prices in the resort bars varied from 1.5-4 Lev. Food - Breakfast - had a good choice of fruit and salad stuff but the hot food (cold) was poor, if you insist on an 'English' breakfast you would be very dissappointed, no bacon, but if you wanted a Greek Salad it was great. Evening meals - The offerings were a bit repetative and generally cold, enough choice of veal, chicken, and fish to vary it yourself, better on the once a week 'Bulgarian' night. Restaurant air con seemed ineffective, but at least there was a row of tables on a balcony which were much more pleasant (apart from the inevitable smokers). There were many restaurants within a few minutes walk so plenty of alternatives. Evening entertainment - Dire and oriented to children, does not matter as there was plenty outside of the hotel in various restaurants, bars and nightclubs. Hotel spotless,staff excellent and unintrusive,help there if required.Food of a good standard and loads of choice.Heard some typical Brits moan about the food,can only say one thing,try something for a change,the world does not revolve around frozen pizza and burgers!!. Effort is being put into entertainment,still a way to go but 10/10 for staff doing their best. Childrens club is low key but if you speak to the entertainment staff they will bust a gut to please,if i worked half as hard i would be much slimmer!!. Our room was on the 2nd floor and overlooked the gardens and swimming pool. It was spacious and in good condition. The bathroom was also in good condition. A nice touch was the supply of shower gel, shampoo, shower caps, cotton buds, sewing kit, clothes brush as well as the usual soap. The food at breakfast was well presented and was in 3 sections. One had cereal and dried fruit, another had meats and salad (as per continental) and the last one with eggs fried, scrambled and scrambled with onion, bacon, sausages both plain and spiced,tomato's and beans. There was a choice of fruit juices. Coffee came from a machine so you go back as many times as you wanted and was quite drinkable. However on the down side. During the last 2 days of our visit there were few people in the hotel and the bacon and beans were done away with and the fried eggs took on a 'Rubbery' texture. The hotel was always clean and the staff where very friendly.We only tried breakfast one morning and it was cold and not very nice but other people staying there seemed to enjoy it so maybe it was us.The hotel charged 25 leva for a deposit box which I would use if only for Peace of mind.The cocktails in the hotel were nice but a bit on the dear side by Bulgarian standards.We spent one night in the hotel and the internment was karaoke which wasn't the best but stayed up drinking till 6am anyway.The hotel is near party street but the noise won't bother you. Rooms were spacious and spotlessly clean. Towels changed daily and clean bed linen two-three times a week. The bath was lovely and deep and the power shower had excellent pressure. There are a good selection of extras in the room including soap, hairdrier, sewing kit, shampoo, shower gel and even cotton buds. The pool is of an average size from looking at other pools in the area and there was always free sunbeds available. Curtains were double lined and had blackout material on the inside the double glazing must have been good because we heard very little from outside the room and the balcony was of an excellent size. We stayed b and b because the food is so reasonable in the resort. We were not disappointed. There was plenty of variety with delicious pancakes, banana and thick chocolate sauce. The service could have been improved with laying of tables and milk jugs etc but on the whole was acceptable. We travelled through party street to arrive at our hotel. I must say I was really worried, but there was no need it was at the very end and away from the hustle and bustle. I would highly recommend walking left outside the hotel to a quieter beach which is kept as clean as most beaches in England. it is a 10 -15 min walk but I highly recommend it with a lovely mineral pool above the beach patrolled with life guards , security staff, doctor, pool bar and cafe serving lovely rolls. We were very pleased with the quality of the hotel. It only opened in June 2004 and was built to a high standard. Our room was cleaned daily with fresh towels.On reading previous reports we did not expect the food to be up to much. We were however plesantly surprised. The food was always fresh and enjoyable. Even our 2 fussy children managed to find something they liked at every meal. We especially enjoyed the hot pancakes with cholocate sauce after breakfast!!! The childrens club lacks resources, cars with missing wheels and dolls with missing limbs. The Hotel Staff made the holiday and a big thank you to Rafi, Mussey, Kami, Alex, Poli, Dani to name but a few. Everyone works long hours with only 1 day off per week. The Life Guards however could have been a bit more pleasant. Entertainment finished a 10pm and then a "duet" played....Simon Cowell would have a field day with them. Overall we had a great holiday. This hotel in new and of a very high standard. Was constantly being cleaned and exceeded our expectations in all aspects. The food was much better than a same standard hotel we stayed in last year. Yes it gets a dull by the second week but I suspect this is more to the 'buffet' style than the quality. Could not fault the breakfasts had everything imaginable and more, even had chap making pancakes 'on demand'. 'Party Street' is where you find the groups of younger people drinking, Odessos is at the end of this street but is not effected by it at all. Hotel is short walk to beach and in very good location. There is entertainment every night but to be honest it wasn't that good, that said neither is most of the 'entertainment' in the bars and restaurants in the resort so I wouldn't let this worry you. The hotel entertainment is the same standard as outside, magician, singers, traditional dancers etc. I would stay in the Odessos again, overall an excellent value hotel, would recommend without a doubt. Hotel location was ok, bit of a trek down a hill to the beach, but never troubled by any undue noise in the evenings. We actually stayed in the Park Hotel Odessos last summer but I was on this site to look at another hotel and while I was here I thought I would take a peak to see what other people had written. There were no other reviews so I thought I would write one! Im not sure where to start with this! One main thing to say is that this hotel is at one main end of 'Party Street' and thats exactly what it is! Great location for the lively end of town. You wont be disturbed by the noise or anything like that but you do need to get out and about and see that Party Street makes up only a tiny section of Golden Sands. You do need to venture past Party Street and see that Golden Sands is huge and there is plenty to do and see. The hotel is beautiful. Its very clean and tidy and the rooms have everything you need. There is a laundry service, mini-bar, sky tv, air con and a lovely bathroom. The staff and reps were all very helpful and friendly and the food is great! There is lots of choice every day and you will find lots of typical bulgarian dishes complimented by fresh pasta, potatoes and veg. You could easily put on a huge amount of weight staying here. The only thing is that you have to pay extra for drinks when you are dining. None of the food tastes or looks like its been reproduced or reheated every day - its all fresh. Entertainment is a harder one to score. If you like bulgarian elvis or bulgarian tom jones singing to you in the evening then you are ok! We didnt stay in once for the entertainment though - its not great. Our rep was fine but be careful when booking trips in the hotel - they can be expensive and 2 of ours ended up being cancelled because they either forgot to pick us up or the weather was wrong. To their credit though we got our money back but it was a disappointment.